Saudi director Mohammed Sendi, the maker of the movie Fatin Drives Me Crazy finds, “filmmaking is just addicting, once you start you want to do it all over again”. Fatin Drives Me Crazy portrays a newlywed couple’s life, whose relationship is defined by the husband’s (Sultan) busy life and how the wife (Fatin) struggles with her dependence on her husband to drop her off to work. Sendi recalls coming up with the idea, then and there during the second edition of the Gulf Film Festival, allowing him to showcase Saudi talent through a Saudi perspective. 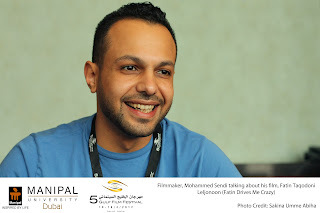 “Every movie is a challenge, but this was my first narrative movie, so I had to deal with all the pre-production process and I think it went smooth overall and I am really happy because that’s not the case all the time”, said Sendi who is currently working on compiling a series of short movies by other Saudi directors.